SPECIAL NOTE: My beloved dad, Robert F. Kruse, subject of my book, passed away Easter Sunday, April 24, 2011. Dad, I'm proud to have honored you by writing this book, my finest achievement. I'll see you on the other side. My everlasting and eternal love, KK. Tuesday June 11, 2019; All day: Your favorite author turns 61! Honest. Saturday June 15, 2019; 8 am - 1 pm: This is my favorite event of the year! Help me celebrate my 61th birthday! Join me at the 25th annual Swap Meet & Fire Engine Rally at the Quinn Fire Academy (19th consecutive year for me), 558 DeKoven St., Chicago. Saturday July 20, 2019; 10 am - 3 pm: Come join me at my first ever SPAAMFAA Convention! The convention lasts from Wednesday, July 17th through Saturday, July 20th. Join us for all the fun and antique fire engines! I'll be selling my book at the flea market on Saturday, located at 100 W. Riverside Dr., Jeffersonville, IN. "The stories are wonderful and the photographs are great. At last I know the difference between a fire engine and a fire truck!" "Karen Kruse has written a remarkable book... terrific read... interesting book... is Chicago history, talks about cemeteries, talks about famous Chicago locations... it's a full package." "The book is full of interesting stories about the firehouse and the surrounding neighborhoods and features some great historical photos from the area as well." "The introduction to your book truly shows the hard work and dedication you have put into creating such a memoir... I am glad to see that you, too, acknowledge their (the Chicago Fire Department's) proud history and importance to Chicago." "The author's words literally became my eyes and imagination..."
"The pictures are all black and white... but the chapters are all colorfully written!" "...well written text...offers a different approach to reporting on the American fire service...refreshing and enlightening..."
"...A Little Book that Made a Big Impact"
The Des Plaines Times calls my program a HOT TICKET ! NOTE: Lectures are given at all library locations, but I'm also available to lecture to other groups, with autographed books available for purchase afterward. The Park Ridge Library calls this program "educationally entertaining." Nominated for the 2001 Pulitzer Prize in History! I'd love to speak to your group, too! Here I am with a 1974 Dodge Monaco refurbished into a CFD buggy. The commissioner rode home after his party in this. 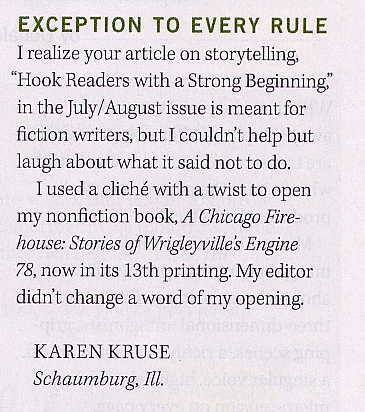 My opening paragraph reads: "Once upon a time is the way all good fairy tales begin, but this particular tale is true. It is the story of an American firehouse, the firemen who love her, and the area she serves. The knights on white horses in this epic are actual heroes riding a bright red fire engine when help is needed. This is the story of Engine Co. 78." Incidentally, my book ends with "happily ever after," as well. My book mentioned on "190 North" - 04/12/09 - My book appeared on screen and was mentioned as part of a "190 North" episode, hosted by Janet Davies of Channel 7 (local ABC news) on a segment about the Wrigleyville area of Chicago. Northwest Side St. Patrick's Day Parade - What a Ride! - 03/04/07 - This time I'm in a Pirsch pumper riding as a member of the Fire Museum of Greater Chicago. I rang the bell (my job) and waved to the crowds, grinning ear to ear! Channel 2 even showed a snippet of me in the parade as part of the evening news. Thanks again to the Fire Museum! Visit to Chopper 2 - 03/04/05 - I had the pleasure of visiting with Kris Habermehl and the staff of Channel 2 (CBS) Chicago. This was THE St. Patrick's Day Parade in downtown Chicago - What a thrill to be in the granddaddy of them all! - 03/12/05 - Once again, the trusty 1956 Ward LaFrance pumper was my ride for the classic St. Pat's Parade down Columbus Drive in Chicago. Northwest Side St. Patrick's Day Parade - Another Great Ride! - 03/06/05 - Once again, in the 1956 Ward LaFrance pumper as a member of the Fire Museum of Greater Chicago I rang the bell and blew the siren for the second time in this relatively new St. Pat's Parade on the northwest side. Afterwards, I was interviewed by CAN-TV! Thanks again to the Fire Museum! Forest Park St. Patrick's Day Parade - A great ride! - 03/05/05 - I got to ride again in the Fire Museum's 1956 Ward LaFrance pumper in the first St. Pat's Parade of the season! Glenview Public Library - Certificate of Appreciation - 03/23/03 - "For outstanding community service through her writing." This event was also taped for Glenview Cable TV. at Pheasant Run Resort & Spa, St. Charles, IL, September 22, 2007. The Booster and News-Star , November 28, 2001. The Hometown Journal , September 10, 2002, as a tribute to those of September 11th, 2001. Several websites also host my tribute article. Glenview TV - GVTV - 01/20/11 through 01/25/11 - 10am, 2pm, 6pm, 10pm each day - TV Cable Interview for "Off the Shelf: Conversations with Local Authors." The Salon an author chat - 05/24/05 - 8:00 - 9:00 pm - Special Guest Author on Live Internet chat in AOL's Author's Chat room. CBS2 TV - 04/07/03 - 11:15 am - TV Interview with Stacia Dubin, complete with photo gallery of pictures, many from the book, held on the day of the Chicago Cubs Home Opener! Library Cable Network - CABLE DEBUT! - 06/13/02 - Cable taping of lecture given at the Park Ridge Library, 01/29/02 - For schedule of future broadcast times and link to site, see above. 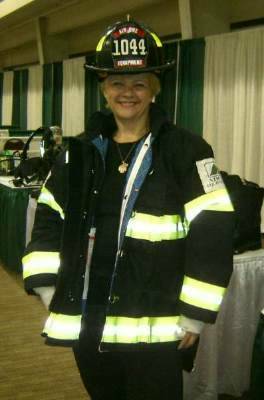 AOL Keyword: FIREFIGHTER - 02/28/02 - 8:00 - 9:00 pm - Special Guest on Live Internet chat in AOL's Firefighter Chat room. NBC5 TV - 10/09/01 - 6:51 am - TV Interview with Art Norman and Nesita Kwan. In the interest of space (and loading this page quickly), only events since 2010 (where dated) are displayed below. Believe me, there are a boatload more! The author with her proud Dad, May, 2001.